The new MMORPG "Albion Online" puts you on an island and gives you the absolute freedom, from the farmer or blacksmith to the powerful warrior or magician, to become just about anything you want. So that you do not loose the overview between all the possibilities, we help you in this guide with seven beginners tips to a good start. The level system is the backbone of "Albion Online." Each resource, weapon, skill, and monster occurs in eight different levels (called "Tiers" in the game). The more you progress in the game, the higher the levels you work with - for example, you need an ax of level 3 to make a level 4 tree. From the wood of this tree you can then build a level 4 bow - if your ability as a bow maker has the appropriate level. It is worthwhile to internalize this system: once you understand how the individual stages build on each other, you will be much more determined by the game world. The so-called Destiny Board is closely connected with the level system and represents the progress of your character. Each time you perform an action in "Albion Online", you get so-called "Archievements", which are credited to a certain place on the board: If you build stones, your abilities are increased and you can cultivate higher levels. If you defeat enough enemies at a certain level, while wearing a certain armor or weapon, you can later wear higher-level armor or weapons. If you make a tool, you will be able to use this part of the way to make better tools. You should also study the Destiny Board thoroughly, so that you can understand which skills you improve with which actions. So you can plan your dream character better and realize it more easily. Apropos dream character: Just because the possibilities in "Albion Online" are so diverse, it is helpful to focus on specific things from the beginning. You want to play a blacksmith, for example, who can make the best armor? Then, from the beginning, gather the resources that are important for you to quickly improve your skills in the smithy. Would you like to play a warrior? Then you should spend more time fighting than gathering. And do not worry, you can retrain at any time, if you do not like your way. If the smiths stinks and you want to plant and sell carrots, you only have to put a bed on and get rid of it! So you do not need to set a target permanently, but you should always have one that you can follow. By the way, the official Character Builder at the "Albion Online" website makes it easier for you to plan your game character and skills in advance. Here you can also get inspiration from other players. The map of "Albion Online" is divided into regions of different colors whose knowledge is most important in the true sense of the word: the color of the region indicates whether you can be attacked by other players, ie PvP fights ("Player vs. Player ") are possible. At the beginning of the game you should only be in blue regions where you are safe from other players. 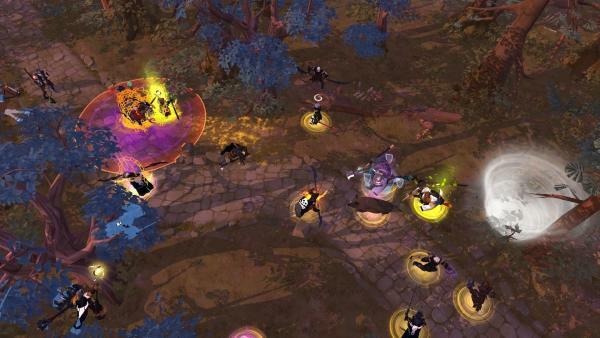 In yellow regions there are limited PvP, which means that players can mark themselves as "hostile" and then attack each player in the area, but also be attacked by everyone. If you are killed by a player in a yellow zone, you will be up again after a short time. Your armor will only end up in a lifetime and you will lose 30% of your collected resources. In red zones, the PvP is exacerbated: Enemy-marked players can kill you and then steal all your equipment. And in black regions, the mark as "hostile" is completely gone - here everyone is released to the shooting! So plan your journeys through the world of Albion, which is exactly and avoidable areas, so that you do not fall victim to half-way robbery. The economic system in "Albion Online" is completely determined by the players. Every item in the game must be made by anyone - and each resource somehow finds a buyer. So look more often at the market place, which exists in every city, and sell there everything you no longer belly. Even the simplest raw materials like Level 1 stone will get rid of you here - among other things, because many players are a bit lazy at the farms. If your character is good at making a rare item, you can also make real money with the sale of your merchandise. Because each city has its own market square, which is not linked to others, the prices differ from place to place. If you compare and take a bit of Expedition, you can easily increase your winnings. If you play with others in the team, you have more from "Albion Online": As a member of a guild, not only is farming, cracking and defeating monsters easier. Also, survival in yellow, red, and black regions is easier to ensure - for example, if a few powerful friendly fighters stand greasy while the woodcutters go to the factory and dismantle high quality materials found only in the PvP zones. Guilds are there in a variety of ways - from the fun-filled fun-filled party with no obligations to a professionally structured organization with daily attendance and constant accessibility of the members via Sprachchat. In "Albion Online" there is - as with many other online games also - a premium status, which benefits your character for a certain period of advantages: You get, for example, additional raw materials at the farms and you can buy your own island. In contrast to many other games, where you have to buy the premium status with real money, you can refresh it in "Albion Online" but also with a game money. This is quite expensive, but the benefits are worth it. So always put a bit of silver back from the beginning!